The one carbohydrate which is essential to muscular growth is called lactose. For example a supplement called Blair's protein contained 7 grams of carbohydrate per 1/4 cup serving — and that carb was lactose, or natural milk sugar. While Blair generally frowned on carbohydrates, only rarely eating fruits or vegetables, he believed lactose was essential to muscular growth. As an animal carbohydrate, lactose is chemically different from other carbohydrates. It digests much more slowly than carbs from fruit, grains, vegetable and other plant sources. Blair believed milk sugar was vital as it allowed the body to produce a host of B-Vitamins in the lower digestive tract and helped favorable intestinal bacteria to flourish. He also believed calcium was best absorbed in the presence of lactose. But lactose's most important role, according to Blair, was as a protein sparer. In the absence of plant-source carbs, the body converts protein into carbohydrate to meet energy needs. 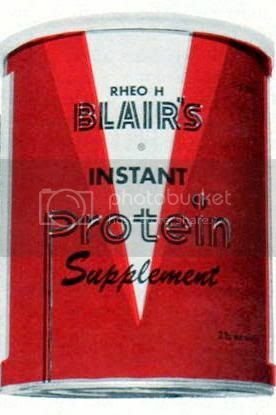 Blair believed lactose met many of those energy needs and helped to keep the body from converting protein into carbohydrate, thereby allowing protein to do what it was meant to do — build lean muscle tissue. The lactose content made Blair's Protein hard to digest. Blair's students took special digestive capsules of hydrochloric acid and peptain (five or six capsules with each meal) to aid in digestion. The digestibility factor is why virtually all protein powders available today have almost no lactose. Lactose may be one of the most important ingredients that made Blair's program so successful.